Endless opportunity and endless information – that’s one way to describe the world we live in. If you even minimal curiosity about the world, you have the ability to distract yourself from work. That’s why you’re learning to improve productivity. The Pomodoro Technique understands that you have plenty of interests AND that you have work to do. Instead of forcing you to quit cold turkey, this method gradually increases your focus over time. Writers have other options to improve productivity while writing. For times where I have sought to write fiction or other material for extended periods of time, I recommend using Freedom (for Apple) or TextRoom (for PC). These tools exterminate the Achilles’s heel of productivity that afflicts many of us. The old line of “oh, I just want to check email, / Facebook / Twitter for a minute and then I’ll get back to work” trap. Rewards are a key reason that the Pomodoro Technique has helped me become more productive. Even if I am working through a dry and boring task – like updating a complex database – I have the reward break just on the horizon a few minutes away. By deciding on your reward in advance, you will have something enjoyable to look forward to during your work. Anticipation is a key productivity lifehack. 1) Reading From A Print Book: Reading a few pages from a print book also gives your eyes and hands a break from the computer. I’m currently reading “Imperium” by Robert Harris, a historical novel set in the Roman Republic. If you are looking for a basic and reliable introduction to the art of productivity, you cannot go wrong by reading “Getting Things Done” by David Allen. 2) Go Outside: by going outside for a few minutes, you can experience some sun and wind. 3) Read An Article: Reading is a major source of leisure for me so I often like to read to relax. If you like longer articles, I recommend Long Reads. 4) Talk To A Friend or Colleague: assuming you are based in an office of some kind, going to talk to a friend for a few minutes makes sense. Not sure what to talk about? You can always improve business relationships with a cookie! Remember to give your eyes a break even if you decide to work longer than 25-30 minutes at a stretch. There’s nothing wrong with seeking to increase your powers of concentration. Simply keep in mind your body has certain limits and it is best not to test those limits too often. The Pomodoro Technique is only the beginning of how to increase your productivity through focus and using limits. Read on to learn about five other methods that can make all the difference in helping you put on blinders to focus your mental energy. The Fifty Minute Focus Finder. This method to improve productivity was created by Dean Jackson. He is the excellent co-host of the I Love Marketing podcast. It is loosely related to Getting Things Done (GTD) principles. Reading One Book At A Time. In re-reading one of Scott H. Young’s articles about reading over 70 books in a year, I discovered this principle again. From time to time, I start reading another book. It’s one thing to decide to abandon a book that is simply not interesting. Creating Sub-Deadlines For Projects: This is a student lifehack I learned years and years ago that can be applied beyond the classroom. Let’s say your manager (or publisher or client) gives you a deadline to complete a project two weeks from today. Taking five minutes to plan your project into sub-components gives you smaller deadlines to reach. 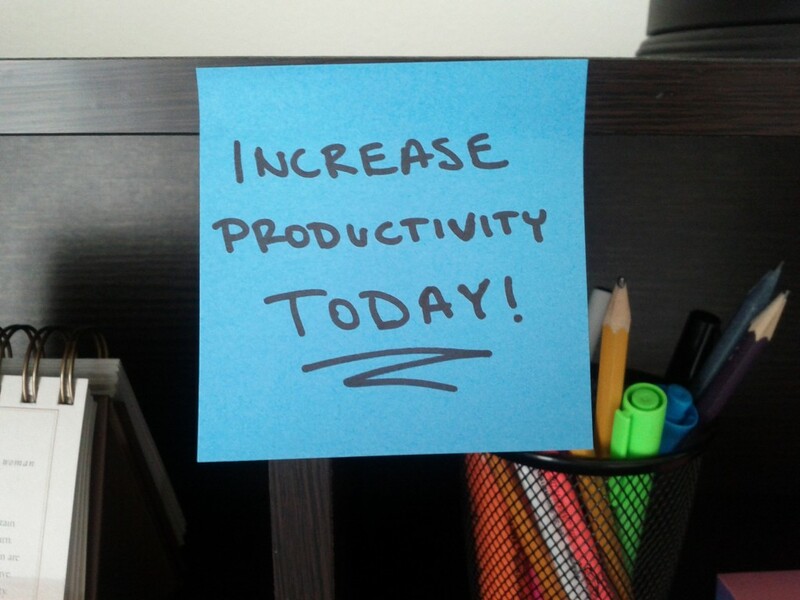 If you’re addicted to the “rush” of racing to meet a last minute deadline, this productivity tip is for you! Making Your Work Into A Game (i.e. The “Personal Record” Hack): A few weeks ago, I started to use Lift App to encourage myself to drink more water. I have also seen other people use the app to pursue fitness goals and writing goals. When I go for a run, I sometimes push myself to achieve a personal record. From time to time, it’s fun to apply the game concept to productivity too. The 30 Day Challenges: Popularized by Matt Cutts from Google in his TED talk, Try Something New for 30 days, this concept is a great way to hack creativity. The 30 day challenge is uncharted territory for me personally. It’s on my list to experiment with later this year. I can see great merit in applying this idea. The 30 day challenge is particularly helpful if you are seeking to build a habit. Researchers have found that habits often take three to six weeks to form. Setting constraints to increase productivity is simply another way to be proactive about how you use your day. Becoming proactive can be a daunting task, especially since “be proactive” is a somewhat vague recommendation to put into action. Using timers and calendars to put structure on your time allows you to ease into the proactive mindset gently. You might be right! I encourage you to experiment with this approach first. It may be a key lifehack that can increase your output significantly. At the very least, your body will get some much deserved rest from constant computer use. Put the concepts of constraints into action for at least two days before you decide whether it suits you. I really enjoyed this read. I’m setting up definite margins in my life so I can essentially ‘work hard, play hard’ instead of just thrashing through my day without accomplishing much or having much fun. I believe thrashing is a term used in engineering to describe a lot of unguided effort with little results. The Pomodoro technique actual works, I have used this for 5 years. Last year I started coding my first program called Stayfocused impelments it. Dion, thanks for commenting on this post. Why did you decide to build software for this approach? How has it improved your results vs using a low tech approach? I have used the Pomodoro Technique for 5 years, started coding my first program Stayfocused last year. I think the program help me log how I spent time everyday better, helps me list all my todos. Every day, when I working, I run my program, check the list, choose the important thing to do, it can open documents\ websites automatically, log time for me. when I work for 25 minutes, it alert me to have a rest. Simple!